Detailing the physical features, habits, territorial reach and other identifying qualities of the Golden Tortoise Beetle. The lustrous Golden Tortoise Beetle gnaws on some garden favorites, but its unusual color often affords it some latitude in the backyard. Few insects boast a truly gold-colored body. The Golden Tortoise Beetle is even more remarkable because it can actually change its coloring at will thanks to microscopic cavities in its cuticle that house pigmentation. The beetle's metallic sheen can be dulled, and that lovely gold can become brown. Upon death, all its metallic glimmer is lost. Like a tortoise, the body of the beetle is humped, or rounded, as if the wing coverings were actually a shell. The bottom edges of the beetle's eltyra are transparent, like glass. 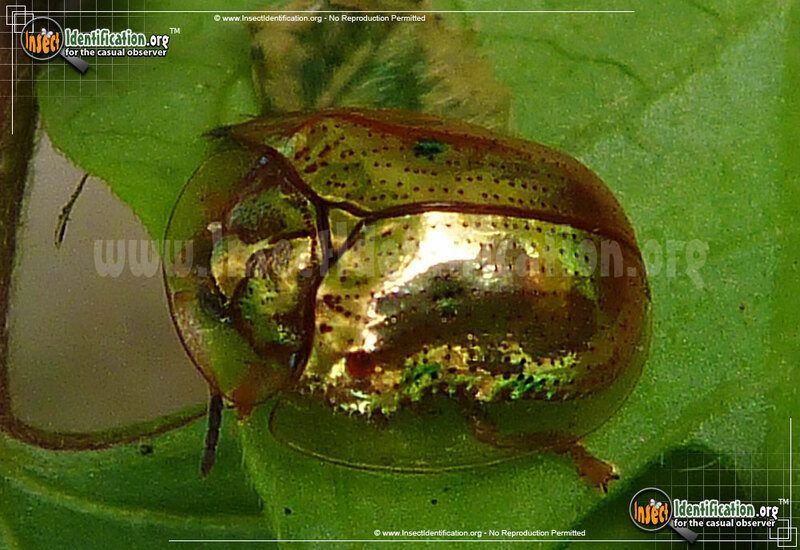 The shiny, metallic Golden Tortoise Beetle is one of many Tortoise Beetles that feed on popular garden vines. Morning glory, sweet potato vines, bindweed and other plants in the Convulvulaceae family. The adults and their larvae chew on leaves and flowers, giving the plants a less-than-perfect appearance. The amount of damage is mild though, and it rarely causes the plant to die. Many gardeners keep the beetles around just to look at them. Eggs are laid in the spring. Larvae hatch and immediately begin eating the foliage of the plant they are on. They are round like adults, but are usually a pale greenish color and have a fringe bordering their entire body. They will molt a few times before taking on their adult form. Larvae tend to drag their old 'skins' at their rear until they finally pupate on a leaf. The adults feed in the autumn and overwinter.